This is the official logo for the Food and Drug Administration (FDA). The Food and Drug Administration (FDA) is an agency within the Department of Health and Human Services. The FDA is responsible for protecting the public health by assuring the safety, efficacy, and security of human and veterinary drugs, biological products, medical devices, our nation’s food supply, cosmetics, and products that emit radiation, and by regulating the manufacture, marketing, and distribution of tobacco products. The FDA is also responsible for advancing the public health by helping to speed innovations that make medicines and foods more effective, safer, and more affordable; and helping the public get the accurate, science-based information they need to use medicines and foods, and to reduce tobacco use to improve health. These products account for 25 cents of every dollar Americans spend ($1 trillion worth of consumer goods). The FDA regulates all of this and it costs the average US citizen less than seven dollars a year (the FDA's annual budget is $4.3 billion, but $2 billion comes from drug user fees). The FDA’s Center for Drug Evaluation and Research (CDER) promotes and protects the health of Americans by assuring that all prescription and over-the-counter drugs are safe and effective. CDER evaluates all new drugs before they are sold, and serves as a consumer watchdog for the more than 10,000 drugs on the market to be sure they continue to meet the highest standards. The center routinely monitors TV, radio, and print drug ads to ensure they are truthful and balanced. CDER also plays a critical role in providing health professionals and consumers information to use drugs appropriately and safely. An investigational new drug application (IND) outlines what the sponsor of a new drug proposes for human testing in clinical trials. Phase 1 studies (typically involves 20 to 100 healthy people). Phase 2 studies (typically involves 100 to 500 people with the ailment that the new drug is intended to treat). Phase 3 studies (typically involves 1,000 to 5,000 people with the ailment that the new drug is intended to treat). The pre-NDA period, just before a new drug application (NDA) is submitted. A common time for the FDA and drug sponsors to meet. Submission of an NDA is the formal step asking the FDA to consider a drug for marketing approval. After an NDA is received, the FDA has 60 days to decide whether to file it so it can be reviewed. If the FDA files the NDA, an FDA review team is assigned to evaluate the sponsor's research on the drug's safety and effectiveness. This review may take from 6 months to 2 years. The FDA reviews information that goes on a drug's professional labeling (information on how to use the drug). The FDA inspects the facilities where the drug will be manufactured as part of the approval process. FDA reviewers will approve the application or find it either "approvable" or "not approvable." Post marketing study commitments, also called Phase 4 commitments. Bringing a new drug to market is a complex process for pharmaceutical manufacturers. For every 5,000-10,000 chemicals discovered by pharmaceutical researchers, only five ever make it to clinical trials, and on average only one will make it to market. It generally takes 10-15 years of research with a median of 12 years to bring a drug from discovery to market. The total cost of this process ranges from $800 million to $1 billion. This image provides a visual summary of the time involved in the drug approval process during the various phases. and at a potential cost of 1 billion dollars it would take the annual income of approximately 25,856 people. Traditional approval requires that clinical benefit be shown before approval can be granted. Accelerated approval is given to some new drugs for serious and life-threatening illnesses that lack satisfactory treatments. This allows an NDA to be approved before measures of effectiveness that would usually be required for approval are available. Instead, less traditional measures called surrogate endpoints are used to evaluate effectiveness. These are laboratory findings or signs that may not be a direct measurement of how a patient feels, functions, or survives, but are considered likely to predict benefit. For example, a surrogate endpoint could be the lowering of HIV blood levels for short periods of time with anti-retroviral drugs. An Abbreviated New Drug Application (ANDA) contains data which when submitted to FDA's Center for Drug Evaluation and Research, Office of Generic Drugs, provides for the review and ultimate approval of a generic drug product. Once approved, an applicant may manufacture and market the generic drug product to provide a safe, effective, low cost alternative to the American public. A generic drug product is one that is comparable to an innovator drug product in dosage form, strength, route of administration, quality, performance characteristics and intended use. 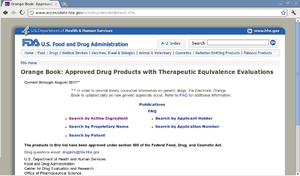 All approved products, both innovator and generic, are listed in FDA's Approved Drug Products with Therapeutic Equivalence Evaluations (Orange Book). Generic drug applications are termed "abbreviated" because they are generally not required to include preclinical (animal) and clinical (human) data to establish safety and effectiveness. Instead, generic applicants must scientifically demonstrate that their product is bioequivalent (i.e., performs in the same manner as the innovator drug). One way scientists demonstrate bioequivalence is to measure the time it takes the generic drug to reach the bloodstream in 24 to 36 healthy, volunteers. This gives them the rate of absorption, or bioavailability, of the generic drug, which they can then compare to that of the innovator drug. The generic version must deliver the same amount of active ingredients into a patient's bloodstream in the same amount of time as the innovator drug. The FDA is responsible for protecting the public health by assuring the safety, efficacy, and security of human and veterinary drugs, biological products, medical devices, our nation’s food supply, cosmetics, and products that emit radiation. The FDA is also responsible for advancing the public health by helping to speed innovations that make medicines and foods more effective, safer, and more affordable; and helping the public get the accurate, science-based information they need to use medicines and foods to improve their health. This page was last modified on 14 July 2014, at 18:36. This page has been accessed 25,212 times.